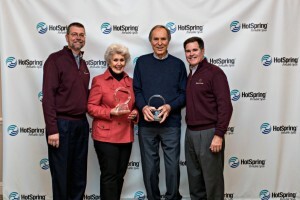 At its 2016 Hot Spring Experience Dealer Conference held in Coronado, California, in January, Hot Spring® Spas announced the creation of a new “Ring of Honor” award to recognize individuals for their contributions to the Hot Spring brand. Honorees are inducted into the Ring of Honor for a lifetime of achievement, as well as for traits that include passion, character, competitive spirit, and willingness to help others succeed. 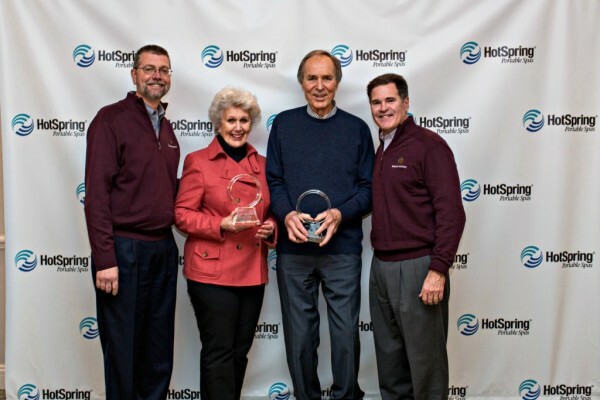 The first Ring of Honor recipients, announced at the conference, are industry veterans Alice Cunningham and Blair Osborn, owners of Olympic Hot Tub in Seattle, Washington, a 32-year Hot Spring dealer. Mike Dunn, Executive Vice President of Watkins Manufacturing, maker of Hot Spring spas, presented the awards. Thank you Hot Spring Spas! Olympic Hot Tub Wins Highest Honor From Hot Spring’s Spas ~ for the 3rd time!